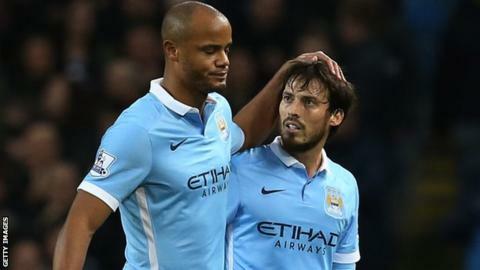 Vincent Kompany has vowed to return stronger from a further injury setback. The Manchester City captain suffered the recurrence of a calf problem after appearing briefly as a substitute in City's 4-1 win over Sunderland. "Today was a bad day for me," he said. "My mindset stays unchanged. I will fight to get what I deserve, my best years in football." Kompany, 29, has been dogged by a succession of calf injuries and missed City's previous eight matches. During that absence, City lost three times in the Premier League. He played for just nine minutes against Sunderland and manager Manuel Pellegrini said the key defender's injury problems were difficult to work out. "Vincent is not the best news," said Pellegrini. "He was ready to return. I did not want him to play the whole game because we have to play so many games, but he worked the whole week with normality. "It is really difficult to understand what happened. We will see tomorrow with the doctor's report but it is the same injury, the same calf." Kompany added via his Facebook page: "My body feels invincible - the best it's ever been - but I'm challenged by a number of small and local injuries. "It leaves me more frustrated than with any of the 'big' injuries I've had but it's a challenge that I will overcome. "I want to be the best defender in the world and I want Manchester City FC and Belgium to become the best club and country in world football. I won't give up that dream. "I will get on with it and when I do come back, I will be stronger again." City scored three times in the first 22 minutes against struggling Sunderland as they bounced back from their 2-1 loss at Premier League title rivals Arsenal. They visit surprise title challengers Leicester on Tuesday. Pellegrini said: "I am happy that the performance was very good - we played attacking football, and I am happy with the individual performances. "I saw we were returning to our normal performance as a team. It is important to continue. We have just finished the first round of fixtures. "Nobody wins the title in December, but it doesn't mean it will be easy to beat Leicester."